Inspiration is all around us. It is what drives us to work hard and pursue our goals. Whether it is about our work life, relationships or recreational endeavors, inspiration is what stimulates us mentally to better our lives. Many runners and other athletes are active on social media, following others on their journeys to get fitter, stronger, and faster. One exceptionally inspiring woman who has motivated so many of her followers to live a healthier and happier life is runner, Danielle Hartman. 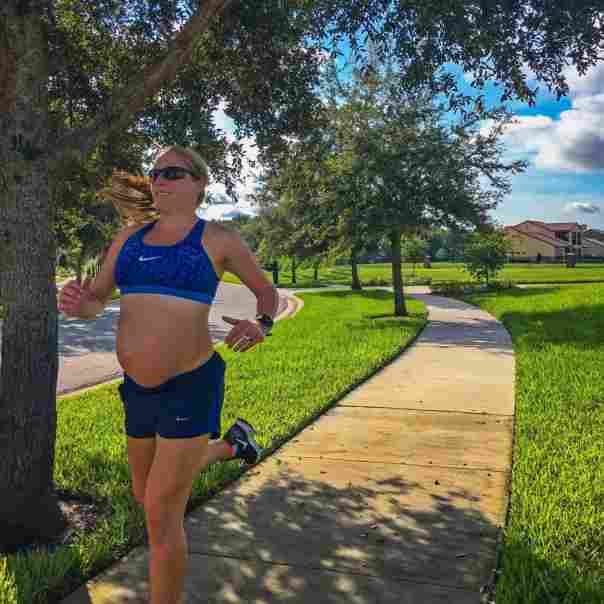 She became a big Instagram sensation as she posted about her growing love for running and her journey to stay fit while pregnant. She recently ran her very first marathon shortly after her son’s 1st birthday, and has clearly portrayed that being a working mother and marathoner is most definitely not impossible! It was an honor to be able to interview her and learn more about her drive to inspire. Why do you run and what made you get into the sport? After marrying my husband and moving to a new city in 2015, I knew I wanted to keep up with my physical activity and finally hang up the soccer cleats. I turned to running because it was just as competitive and I knew I did not have to be on a set schedule due to traveling and working 12-hour shifts. That is what I love most about running is that it is always ME time as I can choose when I feel like lacing up and going. Running allows me to push myself both physically and mentally. I simply earn self-respect. You have inspired so many of your Instagram followers through your posts while running throughout your entire pregnancy. What motivated you to stay so dedicated with training during that time? Being an inspiration is my sole purpose in this running life I live by. From what started out to be posting a few simple runs with my husband quickly grew in to an account of all things running. It was the pregnant running that truly kickstarted my daily inspirations to the runners’ community. What attracted many to my account was that they saw I clearly did my own thing. I portrayed that pregnancy is not an illness and staying fit was key. Running for two was motivation in itself. The idea that I was giving myself and the baby the best health benefits possible is what kept me dedicated to run all 39 weeks of pregnancy. What were the biggest struggles you had trying to stay active while pregnant? First and foremost, running pregnant is not the easiest but most certainly doable. Staying active was never a problem as long as I got my workout in before a full day of work where my energy was fresh and my body was rested. The main struggle was when I would experience too much pressure in my groin area due to the baby’s head down from as early as 28 weeks. I knew running was not an option on those days so I was able to adjust to a new cardio which was the EFX machine. Sounds absolutely insane since you are pumping your legs higher than running form but it legitimately took off all the pressure where the baby’s head was lodged and it almost felt effortlessly (weightless). Keeping active was my number one priority as it ultimately supported a feel-good type of pregnancy. In other words, the days I kept active I felt the greatest during pregnancy. You stayed so fit while pregnant and it seemed like you immediately got into top shape soon after giving birth! How long did it take you to get back into the running? What obstacles did you face once you started and how did you overcome them? I literally ran the day my water broke so taking a break from running was out of the norm for me. The rule of thumb is to be cleared by your doctor first before partaking in any postpartum physical activity. That went in one ear and out the other as I was tired of all the stroller walks and was ready to break free. At just three weeks postpartum, I was able to run my first stroller mile at a nine-minute pace. From then it immediately became an addiction to get back to pre-baby shape. The toughest obstacle I faced was breastfeeding and running. For the longest time, my son was nursing every hour which was frustrating especially when I wanted to do cardio increments longer than an hour. No matter what time it was, I would breastfeed him right before I went out for my run and be back just in time to shower and take care of him for his next feeding. What many do not realize is that breastfeeding burns so many calories; I owe my body getting back in to a decent shape because of it. Another obstacle I faced was regaining back my speed as well as establishing the whole concept of distance running. Before pregnancy I was never much of a runner but seeing how well my body adapted to pregnancy running I knew my body was stronger than I ever imagined. My greatest accomplishment was running a 6:52 mile at just two months postpartum. From there, I quickly learned that not pushing myself back in to high gear so quickly was allowing my body to regain back the speed whether I realized it or not. I began to incorporate one long run a week (generally on my husband’s only off day) and gradually built up the distance game. By five months postpartum, I ran my first practice half marathon without stopping which accumulated a 7:59 average pace. I was very excited and knew my body was well on it’s way. Last but not least came endurance. By incorporating stroller runs (these were about 80% of my weekly runs) which I considered strength workouts, I saw my endurance build up. For me, it was a slow process but when it came to runs longer than a 10K, I did not allow any stopping mid run. It was tough especially during the hot temperature runs, but I truly benefited from this and developed in to a stronger runner each month. You recently celebrated your adorable baby boy’s 1st birthday and throughout that whole first year you were training for your very first full marathon. What inspired you to make this a goal? 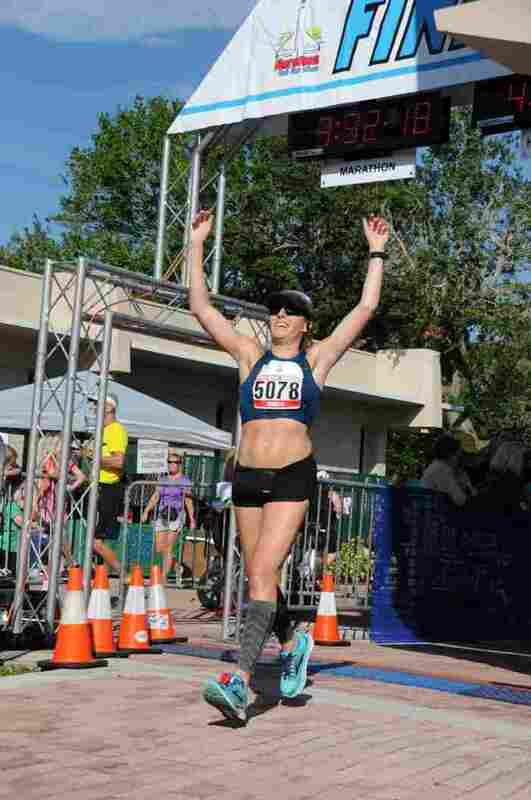 Running a marathon has always been a goal of mine since I began my postpartum fitness. It was finding the confidence to go through with it and believe in myself that I could do it. After seeing all my progress, I had made in a short five months of my postpartum fitness, I knew it was time to research a marathon that would conveniently work for me. After officially signing up I knew there was no backing out or making excuses. It is because of my son, who inspires me to be better each day. There is nothing more valuable than a child’s first year of life and I am proud to say I was able to accomplish a goal so high during a tough time of transition. 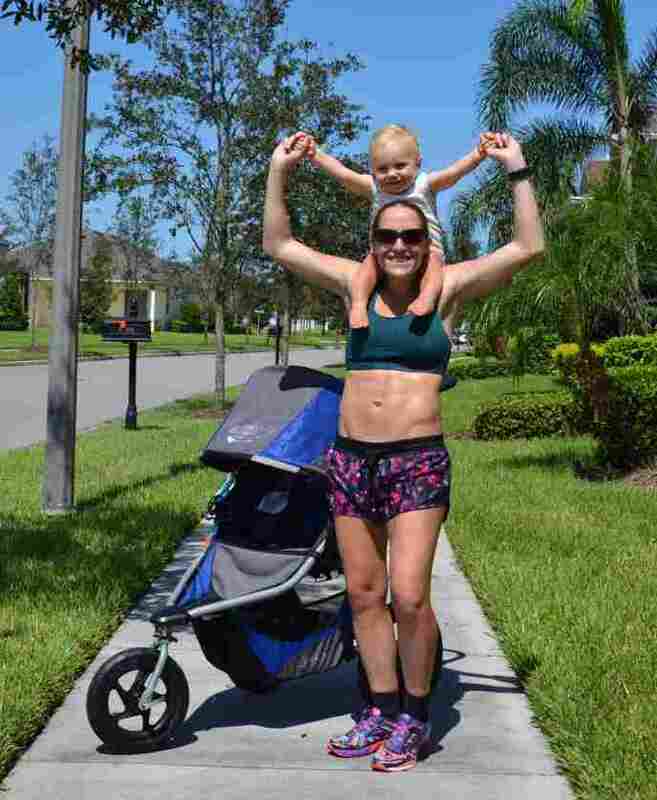 Not many can say that they were balancing being a first-time mom while also training for their first marathon. You recently ran that first marathon with an amazing Boston Qualifying finish time. Congratulations! Was running this race everything you expected? Do you feel you trained properly and if not, what would you change for the next race (if there will be one)? I will never forget my first marathon. To this day, it is my proudest moment as an athlete. I have never worked so hard in my life for a goal that I have had my eyes set on for quite some time. Considering it was my first, I simply just wanted to finish strong and strive for a sub four hour. For the most part, yes, I do feel like I trained properly for a first timer. The time and dedication that was put in to the training process brought to a surprising BQ! For my next race, I have now learned to not start out so fast; it killed me after mile eighteen! I have always struggled terribly with this concept of running as I knew one day it would catch up to me. Go figure, it caught up with me on such an important day but I finished and that is all that matters! What mental techniques or thoughts did you use during your race to help keep you focused and get through the tough times? The marathon was indeed a learning process as well as a leap of faith. I only say that because I had never run more than twenty miles in one sitting. The last six point two miles were the absolute toughest both physically and mentally. I felt as if the marathon began after mile twenty. I quickly learned that mentally talking to yourself throughout the marathon helped tremendously. I never looked at the race as “x amount of miles I had left to go”. Rather, I looked at it as if I had two more miles until the next water station. That helped out quite a bit. My personal motto, “Strong Minded, Unstoppable Runner”. If you go in to a race mentally strong, then you have what it takes to be unstoppable. What lessons has running taught you that you can apply to your life? I would not be where I am at today if it were not for running. My goal is to be better than I was yesterday. To improve myself. To enrich my life. I am running my own race. I compete with no one but myself. This is my journey. It truly relates to my values of life because it fulfills my soul and gives me purpose. Running has given me the power to believe in myself and go after what I thought was impossible. You can follow Danielle on Instagram at @daniellehartruns.